Warmer weather, lighter jackets, blossoming trees — spring is officially in full swing, and with it comes a new array of fresh fruits and vegetables in the kitchen. After many months of belly-warming roasted root vegetables and winter squash, the light fresh greens that arrive with the change in season are welcomed with open arms. 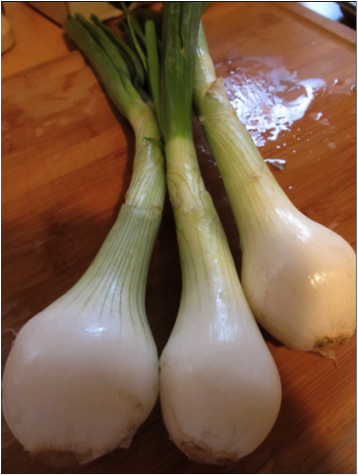 Spring is the season of green vegetables – arugula, asparagus, artichokes, fiddleheads, green onions, pea shoots and others have made their seasonal debut. These vegetables are bursting with flavor and require little preparation, making it easy for novice and experienced chefs alike to create a restaurant quality dish in no time. The beauty of this simple flat bread is that it makes a perfect Friday night dinner to be served with a crisp glass of Sauvignon Blanc or it can be enjoyed as a breakfast pizza for Sunday brunch! Preheat oven to 400° F. Place baking rack in the middle of the oven. Trim ends of asparagus. Brush asparagus with olive oil and sprinkle with sea salt & pepper (I used lavender sea salt, but any coarse salt will do). Roast asparagus for about 10 minutes in oven, rotating after 5 minutes. When asparagus is done, remove from oven to let cool. Then cut asparagus into 1-inch pieces. Turn oven up to 450° F. If using a pizza stone, put stone in the oven to heat. In the meantime, roll out pizza dough to about 10-inch diameter (or larger if you prefer a thinner crust). Sprinkle a handful of flour on a clean surface and on the rolling pin to keep dough from sticking. Put pizza dough on baking sheet and bake for 5 minutes* (if using a pizza stone, leave the pizza on the baking sheet and place directly on top of the stone). Remove pizza from oven and top with pesto (spread evenly, leaving a ½ – ¾ inch edge). Add asparagus, chopped onion, crumbled goat cheese, and shaved parmesan. Bake for additional 5 minutes (if using a pizza stone, you can place the pizza directly on the stone this time). The crust should be slightly browned by now, but not too crisp. Remove from oven and turn oven temperature down to 350° F. Crack one egg on to each half of the pizza and place back in oven for 5-7 minutes, until egg white is completely cooked and yolk is cooked, but will stil l be slightly runny when cut. 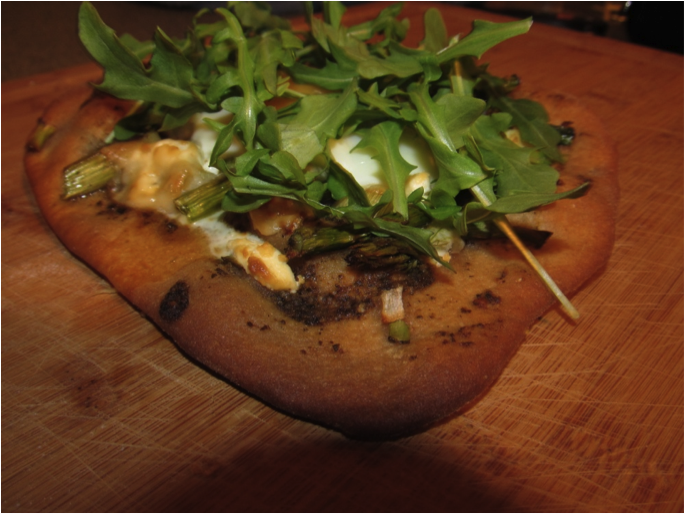 Remove from oven and top with fresh arugula and fresh cracked pepper (optional). *By cooking the dough partially before adding toppings, the dough cooks more evenly and the center of the dough does not become soggy. 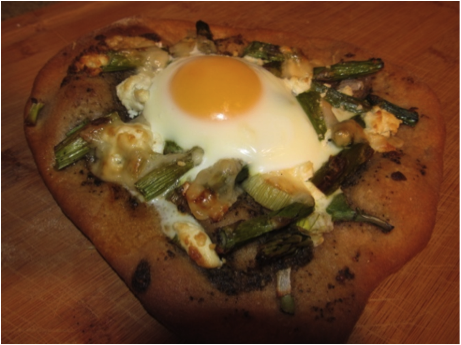 **Because of the egg, this pizza does not make great leftovers. If cooking for only 1-2 people, you can cut the recipe in half or make individual pizzas by cutting dough into fourths (one egg per individual pizza as shown). Sarah Gold is finishing her last semester at Friedman and will begin a dietetic internship this fall at the Brigham and Women’s Hospital in Boston. She enjoys cooking with fresh, seasonal ingredients and is looking forward to spending more time experimenting in the kitchen after graduation. For more from Sarah, follow her at www.foodandfitnessfriend.com.